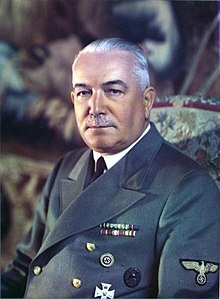 Konstantin Hermann Karl Freiherr von Neurath (2 Februar 1873 – 14 August 1956) wis a German diplomat remembered maistly for havin served as Foreign meenister o Germany atween 1932 an 1938. ↑ Regairdin personal names: Freiherr is an umwhile teetle (translatit as Baron), which is nou legally a pairt o the last name. The feminine forms are Freifrau an Freiin. This page wis last eeditit on 28 Mairch 2017, at 05:18.